This beautiful chalet enjoys a sunny location with a unique view of the beautiful national park Hohe Tauern and the 3657 metre high Großvenediger. The location is perfect, a great view, peace and quiet, a lot of sun, and in winter you can ski all the way up to 700 metres from the house after a day of skiing in the Wildkogel Arena. 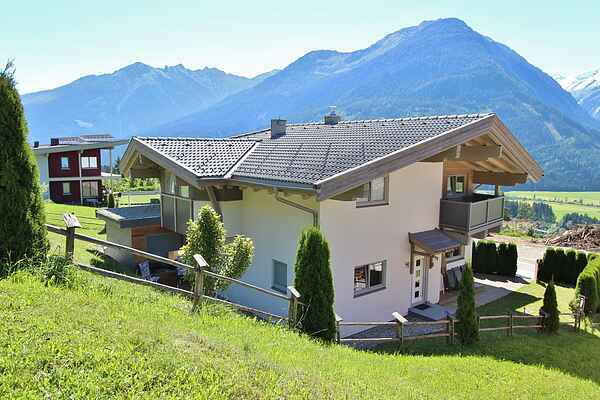 This comfortable chalet is divided into 2 separate apartments, both with an attractive, high-end interior. You will be inhabiting the first floor, which has the feeling of a real penthouse. The details with all the wood and the perceptible roof give a great atmosphere. In addition to a royal living room with an atmospheric interior, there is also a separate kitchen with a dining room, no less than three large bedrooms and a bathroom with a lovely bathtub. The wonderful balcony and roof terrace are excellent for enjoying the beautiful surrounding mountains. Furthermore, there is plenty of storage space, a shared ski storage, and a large shared carport for your car. Neukirchen am Großvenediger has its own ski area, the Wildkogel Arena, but the ski areas Zillertal Arena or Kitzbühel/Kirchberg are also only ca. 15 km away. Furthermore, in the vicinity there are plenty of winter activities and hiking or cross country skiing opportunities. In summer, Neukirchen am Großvenediger is a vibrant village that is only a 5-minute car drive away (or 30 minutes on foot) and the surrounding area is highly recommended for its many hiking and cycling possibilities. Don't forget to visit the highest waterfalls of Europe in nearby Krimml.